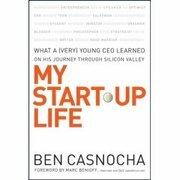 Ben Casnocha, the 19-year-old founder of Comcate, just published his first book called My Start-up Life . It came out in stores today and I highly recommend the book. it is a great personal journey filled with interesting anecdotes, tidbits, and words of wisdom. But please buy the book this Monday (May 21) … if everyone buys the book the same day it will really affect the Amazon sales list (I personally plan to buy 4 copies on Monday). Ben is one of the most impressive people I know — certainly for his age. he’s extremely well-read, very smart, and is a talented writer. It is hard for new authors to make it — but Ben is worthy of our support. please support Ben Casnocha this monday. This entry was posted in Books/Movies/Shows on May 18, 2007 by auren.